1.It is a privilege for me to be present amidst the galaxy of legal minds of the country and to receive the first copy of the book titled, "Statement of Indian Law: Supreme Court through its Constitution Bench Decisions since 1950”. At the outset, let me congratulate the author of this volume, Shri Govind Goel, for his meticulous collection and in depth analysis of all the Constitution Bench judgments of the Supreme Court. Shri Goel has, to his credit, over three decades of rich experience in practicing law at the Supreme Court and High Courts. He has been involved in many landmark cases. His abiding and focused interest in constitutional, administrative and civil laws makes him truly competent in authoring a book of such volume and intensity. I applaud the author’s immense industry and insight in rationalizing the Constitution Bench decisions –ratio decidendi – in an objective and compact manner. 2.In 1950, we the people of India gave to ourselves a sovereign democratic republic to secure all its citizens justice, liberty and equality. We undertook to promote among all citizens fraternity, the dignity of the individual, and the unity and integrity of the nation. These ideals became the guiding light to a modern Indian State. The Preamble, the Fundamental Rights, the Fundamental Duties and the Directive Principles of State Policy contain the ingredients of good governance. 3.The spacious provisions of our Constitution have allowed our democratic polity to address the evolving needs of a growing nation. The founding fathers of the Constitution laid out an exhaustive mechanism for governance with specific provisions to deal with future variations. These necessities were envisaged to be resolved constitutionally by the Supreme Court. This has been enabled through the exercise of Advisory jurisdiction to be invoked by the highest functionary of the Republic. The instrumentality for lightening up the constitutional path by the rendering of opinion by the Apex Court is the Constitution Bench, that is, a Bench comprising at least five Judges. Likewise, any ambiguity about the interpretation of the Constitution involving a substantial question of law is resolved by a Bench of at least five Supreme Court Judges. 4.Indeed, judiciary is the final interpreter of the Constitution and laws. Over the years, the Constitution Bench has interpreted the Constitution to counter numerous sensitive and complex constitutional situations. Its adjudications have infused life into the words of the Constitution making it a vibrant document. 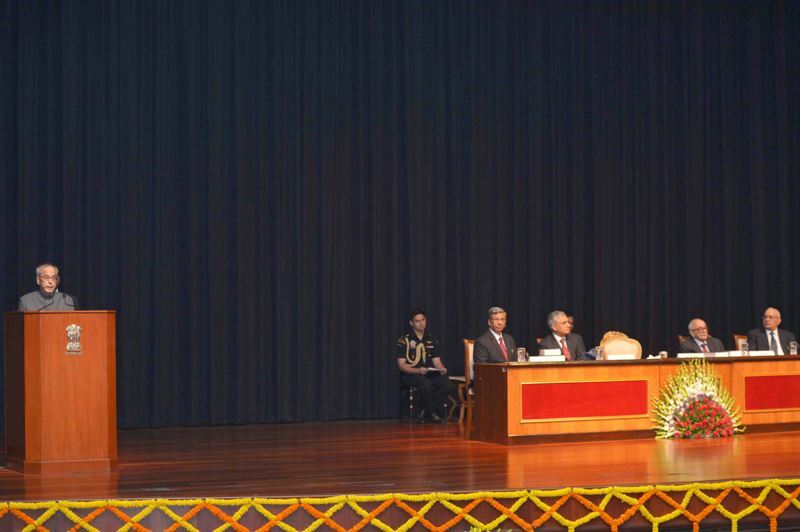 It has provided guidance on constitutional norms and virtues which are essential for governance. It has also provided occasions to exercise constituent powers by virtue of the fact that the law as declared by the Supreme Court is binding on all courts and tribunals within the territory of our country. 5.Constitution Bench decisions have also prescribed constitutionally permissible boundaries for each organ of the state. They have at times invalidated the exercise of power and authority that violates constitutional provisions, including the basic structure of the Constitution. The uniqueness of a Constitution is that while the words can be amended, the ‘constitutional silences’ are indisputable. It is the solemn responsibility of the Constitution Bench to decrypt and amplify these ‘silences’. 6.Constitutional Bench decisions have exhibited a reasonable degree of durability and have left indelible footprints on the sands of time. Of the 2,296 decisions of the Constitution Bench, only about one percent have been overruled, which is considerably less than the number of constitutional amendments. Yet, there may be a possibility, and more so desirability, of revisiting the correctness or relevance of a decision as per the contemporary needs of society. 7.Unlike the Supreme Court of the United States, where judges are appointed for a life term by the political executive keeping in view ideological preferences, judges of the Indian Supreme Court are appointed through a non-political process uninfluenced by such considerations. As a result, the law that has emerged having been interpreted by the Constitution Bench of Indian Supreme Court navigates through diverse social, economic, political, cultural, historical and ethical moors. This has made the Constitution of India a living organic document keeping pace with the changing times. 8.Constitutionalism is the primary edifice on which the Indian democracy stands. It is the Constitution that is supreme rather than the three pillars of democracy - Parliament, Executive and Judiciary – that the Constitution provides. No individual or organ of our democracy is higher than the law.Each organ of the state must operate within its own sphere and must not appropriate what has been assigned to others. The exercise of authority by the legislature and executive is subject to judicial review. However in the exercise of authority by the judiciary, the only check possible is judiciary’s self-imposed discipline and self-restraint. The balance of power between the three organs as enshrined in our Constitution must be maintained at all times. 9.The rule of law is the hallmark of our democracy, due to which every Indian feels empowered, making him or her participate in nation-building with full vigour and enthusiasm.As an upholder of the Rule of Law and enforcer of the right to liberty and equality, the role of the Judiciary is sacrosanct. The faith and confidence people have reposed in the Judiciary must be upheld always. For justice to carry any meaning for the people, it must be accessible, affordable and quick. 10.Justice for all, which implies access to justice even for the poorest of the poor, is the paradigm for a well-functioning judicial system. The Indian judicial system has made rapid strides towards making judicial access a reality. Given the developing economy framework, our judiciary has enlarged the scope of justice. For the enforcement of fundamental rights, the Supreme Court through judicial innovation and activism has expanded the common law principle of ‘locus standi’. It has been made possible for courts to permit anyone with sufficient interest and actingbona fide to maintain an action for judicial redress, and to activate the judicial process. In the support of rights, courts have found a post card or newspaper article to be material enough to set-off judicial action. This has helped to bring justice closer to the common man. 11.An affordable judicial system is critical for a country with many of her citizens at the bottom of the socio-economic pyramid. Many a times, aggrieved citizens hesitate to knock the doors of the judiciary because justice has often been found to be time-consuming and costly. Several steps have been taken in our country to make it less costly for the common man to seek justice. The Legal Services Authorities Act was enacted in 1987 to give a statutory base to uniform legal aid programmes throughout the country. Successive Chief Justices of India have played key role in enforcing the Act. There is also a need perhaps to undertake greater efforts at legal literacy. 12.Quick delivery of justice is the third pre-requisite for an effective judicial system. It must receive focused attention as delay in administering justice is tantamount to denial of justice. There are over 60,000 court cases pending in the Apex Court, another over 40 lakh pending in the High Courts, and over 2.6 crore in the district and subordinate courts. Multi-directional efforts are necessary to alleviate this problem. Courts should possess adequate resources to improve their infrastructure. Shortage of judges must be mitigated by filling up vacant judicial positions on priority. As litigation is often time-consuming, alternative dispute resolution mechanisms like mediation and arbitration must be encouraged. There is also a case for greater use of technology solutions to quicken the process of justice and facilitate the litigants as well. 13.An autonomous judiciary is thesine qua non of a true democracy. Being a critical pillar though, it must introspect and wherever necessary self-correct in order to cater to the evolving needs of the polity. With these words, I conclude. I once again compliment Shri Goel for his stupendous effort. The book penned by him on Supreme Court judgments on constitutional matters, I hope, will prove to be influential in shaping constitutional thought in the democratic world. I wish you all the very best for the future.